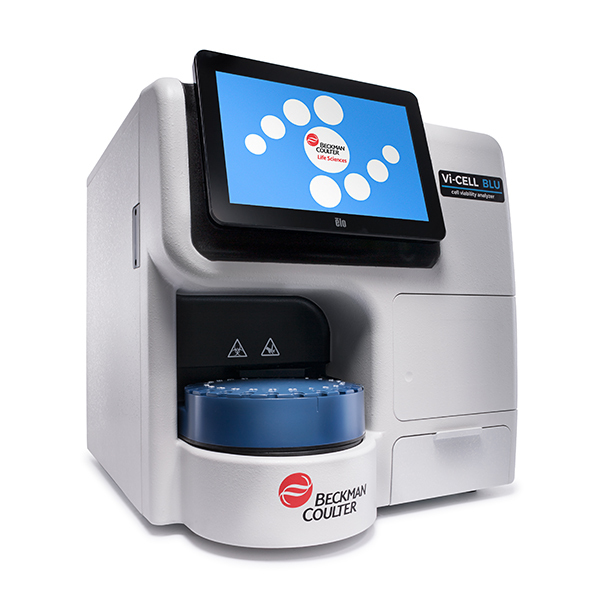 Beckman Coulter have incrementally yet significantly improved the Vi-CELL XR instrument with the next-gen Vi-CELL Blu. Being also a brightfield microscopy-based instrument using the tried and true Trypan Blue dye exclusion principle – the Vi-CELL Blu utilizes a new continuous flow optical flowcell for the imaging. This removes the stop-start nature of the individual image taking and sees a 28% reduction in analysis time as standard (and a 50% reduction in “Fast mode”). The Vi-CELL Blu also sees a variety of ergonomics improvements – including the moving of the reagents & waste bay to the front of the instrument from the side, both allowing for easier user access and decreasing the required lab-bench footprint. The integration of the control PC into the instrument itself and moving to a touchscreen input – allows for more efficient software interaction plus removes necessity for keyboard & mouse making it ideal for GMP production/cleanroom environments.